Are you working like a stained glass window? When Jesus spoke of the lamp today, he wants us to see ourselves as the lamp. For his light to be seen through us, we must first let His light illuminate our thoughts, visions, attitudes, and even our whole selves. In turn, each of us can be a light to others, and our families can be Christ’s shining light to other families. How do I shine Christ’s light to others? Jesus wants our light to be seen! Comfort those who struggle in the shadows by praying with them, listening to them, and being kind. About Father Jilson Tom, C.S.C. Father Jilson Tom, C.S.C. is from the Northeast India Province of Holy Cross. 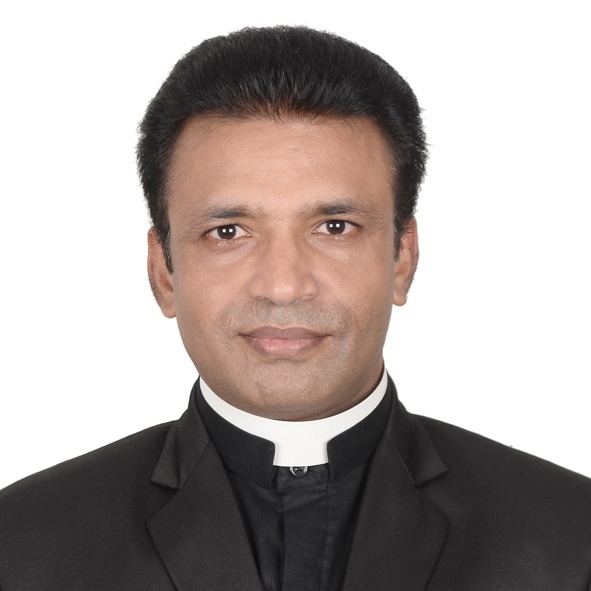 A native of Kerala, Father Jilson has been serving in a parish and school ministry since his ordination twelve years ago. He joins the Family Rosary team as an Assistant, while he works to study Pastoral Counseling in the Boston area. With a personal devotion to Mother Mary, Father Jilson is thrilled to be working to enhance family prayer through the Rosary. And if you ever need a listening ear or want to play a board game, Father Jilson’s your guy!